Cream Tree – Made in S.A.
Just in time for winter, I received a skin and hair product hamper from Cream Tree which I have been using in these past months. Cream Tree is a relatively new home grown beauty brand meant for the diverse women of Mzansi. Charmane, Bhauna, Mpho and Pam are the inspired souls behind this local brand that promises quality affordable beauty products. The Cream Stick, as the name suggests, is a body moisturiser that comes in a stick form, unlike the tub or tube variation I am used to. Applying it may feel a bit strange at first, but the products itself is rich, nourishing and surprisingly long lasting. It is available Fragrance Free or in an appealing vanilla and coconut scent of the Buttercup Cream Stick. When not used after a hot bath, I find it to melt faster when rubbed on my hands than when applied directly on my skin. Because the Cream Stick is conveniently portable, I have been keeping mine handy in my handbag. The French Strawberry Lipsliq is an unpretentious lip balm with a delectable strawberry scent. It adds moisture and shine without caking up on the lips. I am hooked on mine and I’ve used it within an inch of its existence, I will need a new one soon. 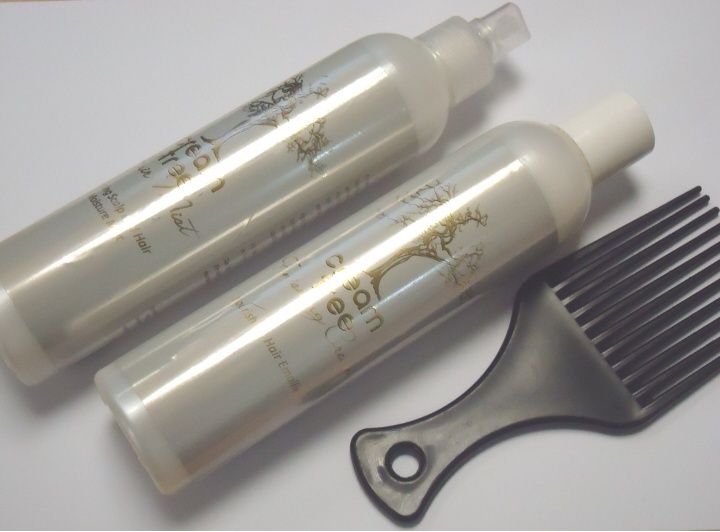 The Hair Mist is meant to moisturise both scalp and hair. I got to moisturise my natural hair while it was covered with braids without getting the braids or scalp greasy. This is a product that a lot of naturals will find it ideal in the battle against dry and tangled coils. Since the Hair Mist is non-greasy, it is best to seal-in with an oil hair spray. The Finishing Cream is also not greasy and it works well with the Mist spray in making a dry Afro easy to manage and style. While the spray provides moisture, the Finishing Cream gives the hair the slip-ability that protects hair from being damaged by combs and brushes. I am not big on scalp treatments, mainly because my puffy Afro tends to protect my scalp from the drying weather, but this Cream Tree Hair Food came just in time to nourish my scalp when I had synthetic braids installed after 15 years of loose natural hair. The Hair Food has a distinct smell and a distinct Vaseline Blue Seal Petroleum Jelly look to it, yet without the stickiness. It easily melts into the scalp and I liked it better than most hair foods I’ve used in the past. The Cream Tree Vanishing Cream is a facial oil controlling cream and I love it to bits. I have a combination skin and keeping the oil on my t-zone under control is important to me. This mattifying cream does not dry or leave my skin feeling tight or looking ashy, which has been my problem with other vanishing creams. It keeps my skin shine free for hours while I maintain a natural glow, because of that, it is by far my favourite Cream Tree product. I predict that South African women with oily and combination skin are going lap this cream up once it hits the shelves. Cream Tree is mostly available in KZN and Gauteng, but you may contact them on their Facebook with product queries and samples. I’m not one for vanishing creams, but I love the Cream Tree Vanishing Cream. It does not give you that overly powdered look. This is such great news. A proudly South African product. Just love it.